* Implements hook_entity_property_info_alter() on top of book module. // Add meta-data about the added node properties. t("Book ID"), 'type' => 'integer', 'validation callback' => 'entity_metadata_validate_integer_positive', 'description' => t("If part of a book, the unique ID of this page's book. "), 'getter callback' => 'entity_metadata_book_get_properties', ); $properties['book'] = array( 'label' => t("Book"), 'type' => 'node', 'description' => t("If part of a book, the book to which this book page belongs. "), 'getter callback' => 'entity_metadata_book_get_properties', ); } ?> The 'getter callback' is used to get the actual value of the property as described in the metadata - this is important to ensure the data exactly looks the way it is described. Consider a date value: Entity metadata defines that a date is represented as timestamp in UTC as documented, thus modules can rely on that. Similarly it defines data types like 'text', 'integer', 'decimal', 'boolean', 'date', 'duration', 'uri', as well as 'struct' for arbitrary data structures and any entity as registered to the system. Additionally it supports a generic 'list' construct, as well as lists of a specific type, e.g. data of type list<text></text> is represented as an numerically indexed array of strings. Apart from getter callbacks there are other optional callbacks, like a 'setter callback' for writing back data, an 'access callback' or a 'setter permission' for establish property-level access control, etc. Also note that Entity metadata automatically adds in information for any field, as long as it knows about the field type. Thus, if you add a new field type, tell it once how to handle it, and any instance will be supported automatically. Metadata? I've my own module integration! Yes, you might have and of course it works. 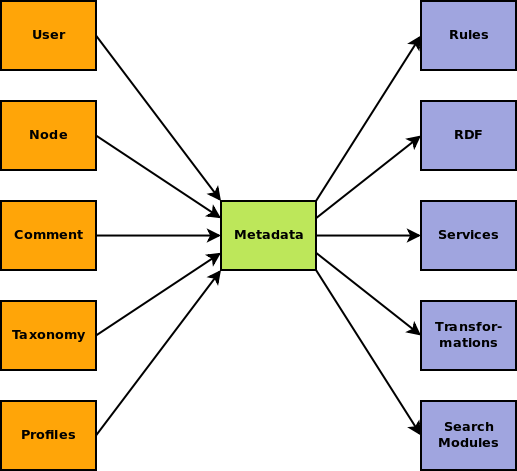 But the point about metadata is to avoid re-inventing the wheel to provide basic information lots of modules need again and again. Instead let people define the information once, but use it a couple of times! My need for metadata was Rules, however I decided to to go for a general, re-usable metadata format instead of doing it for Rules only. Why? To enable reuse and avoid duplication. That way other modules may benefit from the module as well, in turn Rules would benefit if more modules provide metadata. As seen on the figure, many modules beside Rules could make use of the metadata. First off modules that want to export, import or transform data could easily make use of the metadata, but also search modules like the Search API or Services would be a natural fit. Oh, and apart from that Entity metadata also provides tokens for any textual property that has none yet. At this point, let me mention that the originating idea is from my friend jpetso, who created the fieldtool for Drupal 6. I just took the idea to D7 and entities. First of all, thanks for your work on the RESTful module, it is great :) I created a custom module that we use to store images from cloudinary. When I view content that has this module, in json format for example, the fields are not being returned. I've created "cloudinary_entity_property_info_alter" in the .module file, as well as adding "cloudinary_entity_property_info" in there too, but the data is not returning. Any idea what I need to do?